In this article we introduce you to the WoodCore vinyl shutters from ShutterSMART and why they make for a classic yet affordable window covering option for your residence. This product is one of our favorite trends in window treatments for 2015. The vinyl coating over durable wooden core makes this a great idea for kitchen window treatments. Laundry rooms are another area that requires window coverings that are resistant to high-moisture, an issue even in the usually dry San Diego, CA climate. Most notably, vinyl shutters with a wood core offer the strength of wood for a more affordable price. 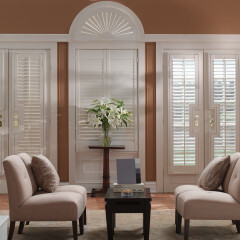 Though made from a less expensive material, it is difficult to tell the difference between real and faux wood shutters due to the quality manufacturing techniques. 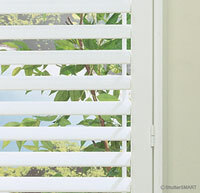 Vinyl shutters offer more resistance to weather and the elements. Therefore, these shutters are the perfect window treatment option for bathrooms, kitchens, and laundry rooms, or if you prefer to leave the windows open. In situations where traditional wooden shutters may warp, vinyl coating over a wooden core keeps these window treatments looking good for many years. O’D McKewan of 3 Blind Mice reveals this fresh, hot, new product from the 2015 International Window Coverings Expo. Vinyl shutters combine strength, durability, and aesthetic appeal at a lower price point comparatively to other shutter options. Even with their vinyl outside coating, it can be difficult to distinguish the difference between real and wood core. WoodCore vinyl shutters are manufactured similarly to hardwood shutters, but finished with a PVC coating for better moisture resistance. Since they are made with less expensive material, vinyl offers a more affordable option than full wood shutters without sacrificing quality or durability. The strong, durable wooden core allows for more weight bearing capabilities, meaning the shutters can span the width of larger window spaces without bending and warping. And, since shutters made of vinyl are free of dangerous dangling cords, they make for the perfect child safe window treatment option for homes with small children. 3 Blind Mice carries many varieties of shutters to fit whatever room, style, and price point you are after including vinyl shutters, hardwood, and composite shutters. Shutters bring a classic design for any home, offering a clean look on both the inside and outside. Allow for privacy and light control in any size space. Download our free window treatment buyers guide to learn the best window treatment options for your home! Vinyl shutters, though offering weather and moisture resistance at a lower cost, lack the structural integrity of composite shutters. 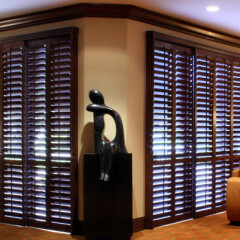 WoodCore vinyl shutters combine the strength of wood with durability of vinyl and make a great in-between option. Wooden plantation shutters are a high-end, classic choice for your home’s windows. Wood can be customized with various stains and paints to match the interior of your home and color preferences. Wood is also the strongest option, meaning they can span larger windows in living rooms and family rooms. Call us at 858.452.6100 or contact us online to schedule an appointment and choose the right vinyl shutters for your home.